The Weather Group and its cable network The Weather Channel and The Future Group have partnered to offer immersive mixed and augmented reality technology. 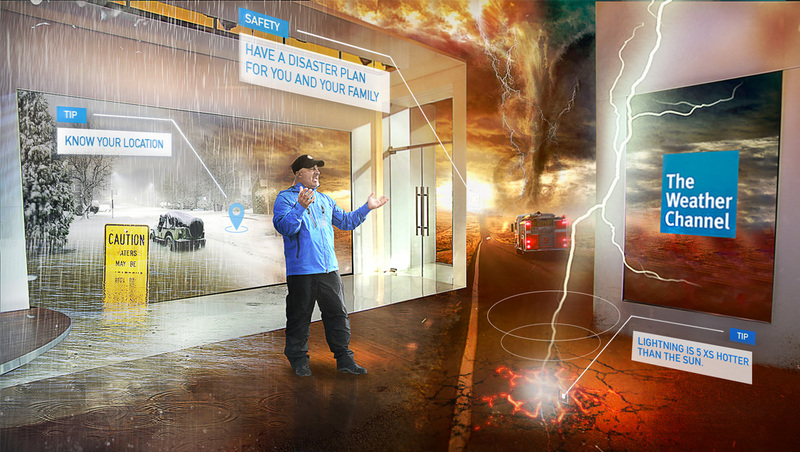 Through this partnership, The Future Group will deliver custom immersive mixed-reality experiences for viewers of The Weather Channel, using The Future Group’s Frontier powered by Unreal Engine. Unreal Engine offers a complete suite of creation tools designed to meet ambitious artistic visions, particularly in the video game industry with games including Fortnite and hyper-reality experiences such as “Star Wars: Secrets of the Empire,” using the platform. Since launching award-winning live augmented reality experiences in 2015, The Weather Channel has created an amazing amount of content that allows the network to tell weather stories, explain the atmospheric sciences and help convey important safety and warning messages to viewers. By harnessing the power of advanced, realtime graphics renderings and visual effects with Frontier powered by Unreal Engine, The Weather Channel is further pushing the limits of broadcast presentations for real-time immersive storytelling. For example, viewers will see towns and local street corners recreated in detail as well as features such as visualizations of meteorologically accurate tornadoes, hurricanes and the devastating effects of storm surge. “TFG’s Frontier enhances the amazing capabilities of Epic’s Unreal Engine specifically for broadcast and we are very excited to be pushing the creative boundaries of real-time mixed reality for TV with the Weather Group…” said Lawrence Jones, head of North America operations for The Future Group.